Slight break in the weather provided an opportunity to take a couple guys out for their first deep drop and search for some Mahi. Stopped on the reef to try for some grouper and muttons first. Put some live bait on the bottom and used a chicken rig to get more bait and see what else was down there. The bite was very slow, couple grunts, small yellowtail, beak-offs and a shark. With no action and slack tide coming we pulled anchor and headed south. On the way out to the deep drop spots we were hunting for Mahi. Seas still rough and weed lines were not getting very organized. We did find birds in some scattered weeds from 450 – 650’. 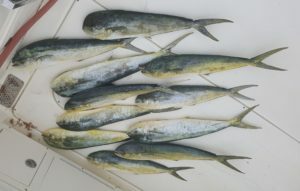 Worked 6 different areas and picked up 11 mahi one at a time. We never came across a school to pitch too. With several dinners in the box we turned to the bottom spot in about 650’. Had five pounds of lead but that was not enough. Had a very hard time holding the bottom but the brief time it did we got hooked up. At first I thought we snagged something but then it came free and was fighting. The electric reel overheated and tripped the breaker twice. Todd had to hand crank it and it was definitely not a tile fish. We are hoping for a big snowy. 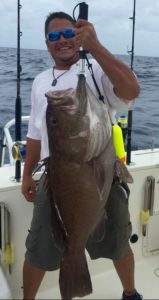 We crank it up in the rough seas and finally get the beast to the surface. Grabbed the net and got it in the boat. Hi fives and couple pics and a snowy on their first deep drop trip.